This announcement is being made with an extremely heavy heart, and we know it may not be a popular one. However, Alee and I have made the decision that we are going to be closing Chasing the Sun by the end of the month. Originally, we were going to wait till the end of the activity check before making the call either way, as no doubt some of you picked up from my introduction to the check itself. But, after seeing some of the most recent hiatuses and their updates, and talking with a few members who will not be continuing on the site, we’ve decided at this stage in time, it’s the right time to bring things to a close. 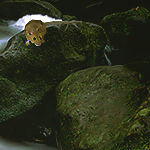 Chasing the Sun is a play-by-post roleplay based on the Warriors series by Erin Hunter. 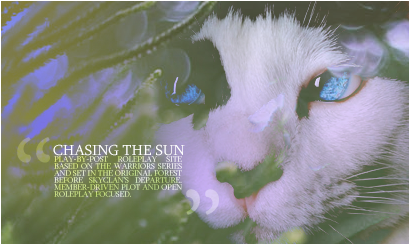 We are set in the original forest in an alternative universe from the books, where SkyClan were never forced from the forest and the characters we have known and loved have not existed. We have a 150-word minimum and a sandbox roleplay setting that does not have an overarching plot, only those that members form together. The world is there to shape by the characters than inhabit it, growing the forest into something unique from what we have seen before. With plenty of characters and a community that is always looking for new people to join in the fun, we are always happy to have new faces joining the ranks! Take a look around, and we’d love to have you on board! LEADER: DUCKSTAR, RPED BY CRES. the season is new-leaf, third moon. the weather is consistantly warmer, with a fair few storms rollings through, however mostly clear and comfortable for all. the chill in the morning is still there, however is starting to ease, and prey blossoms. Due to a change of high ranks that is to take place, this plot has been updated and modified. if you were originally involved, please make sure to check the thread and voice if you still want involvement as soon as possible! The Forest Prince is the the current thread leading into the start of this plot. Redstar, Rosestar and their fellow high ranks of WindClan and ShadowClan have met on the border of the clans and formed a truce, after it has become aware that a group of rogues has become a threat. Both leaders have addressed this issue in their clan meetings, with Rosestar setting the rule that until the rogues have been dealt with, cats are not to leave camp alone. A significant change has taken place in the direction of this plot, and the main post has now been edited to reflect such. We are still looking for WindClan cats to be involved, so if you have a cat you’d like to have something happen to, places are still open. With the border clash narrowly avoided by Pinestar’s intervention, steam has yet to ease, as the SkyClan patrol stand in camp to address the clan getting too ambitious. Meanwhile, with the change in leadership of RiverClan causing discomfort across the clan, there is no doubt that everyone is on edge. Another clash is imminent.